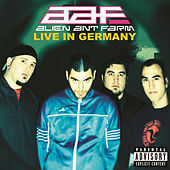 In the early 2000s, Alien Ant Farm were among a handful of bands that rose to massive -- if brief -- prominence as the limelight was captured by a post-Creed form of metal that appealed to the kids, didn't offend any parents and ultimately sounded good on the radio. Papa Roach (who helped break A.A.F. ), Mudvayne, Puddle of Mud and A.A.F. themselves (among others) formed a heavily made-up/bizarrely coiffed group of semi-metal rock bands that dominated late-night talk-show spots, contributed to film and video-game soundtracks and provided the wrestling world with theme music galore. In 2001, on the heels of Papa Roach's unforeseen overnight success, Alien Ant Farm became equally huge on the strength of their cover of Michael Jackson's "Smooth Criminal." The album, ANThology, sold a million copies, but the sales of 2003's follow-up, truANT, were not so robust; to make matters worse, the band's DreamWorks label went under in 2005. A third album, 3rd Draft, that was slated for release by the label was shelved. That album eventually appeared as Up in the Attic, released by Universal Music Group in 2006.